UPDATE: After previously stating it would sue KTVU-TV over this incident, Asiana Airlines has reversed course and says it no longer intends to pursue legal action against the station. 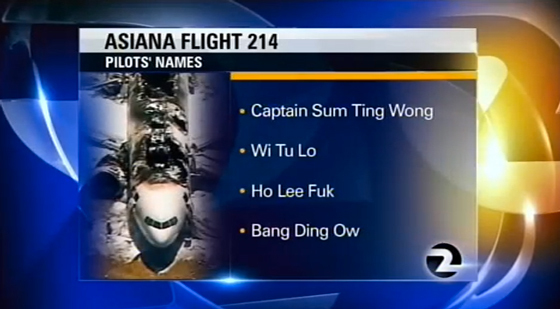 KTVU-TV, the Fox affiliate in San Francisco, apparently fell victim to some kind of prank and aired a fullscreen graphic listing the purported names of the Asiana Flight 214 crew during its noon newscast Friday. The names “Sum Ting Wong,” “Wi Tu Lo,” “Ho Lee Fuk” and “Bang Ding Ow” appeared on the station’s newscast as shown above from Uproxx (say them out loud to yourself). After airing the graphic, the station went to a break and, upon returning, aired a correction, saying the names were actually verified by an NTSB official. The station also published an online apology. This past weekend viewers flocked to KTVU Channel 2 News for coverage of the tragic crash of Asiana Airlines Flight 214 at San Francisco International Airport (SFO). KTVU Channel 2 News owned this breaking news story with a number of firsts! First with alerts to mobile devices. First on Twitter & Facebook. First with aerial shots from KTVU NewsChopper 2. First with a live reporter from the scene. First live interview with anyone connected to someone on the flight.